House of the Dead: Overkill has had 33,443 players report play-time data on the Nintendo Channel, since the game released in February. The Conduit was released in June, and has had 49,563 players report play-time data on the Nintendo Channel. 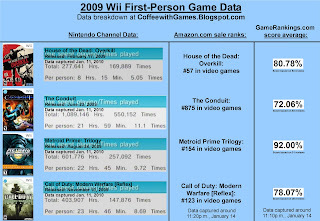 Metroid Prime: Trilogy has had 26,449 players report their data, since the game released in August. Call of Duty: Modern Warfare [Reflex] was released just in November and has 17,016 players report data on the Nintendo Channel. House of the Dead: Overkill had 277,641 Total Hours reported, an increase of 7,263 hours from last week. The Conduit had 1,089,146 Total Hours reported, an increase of 22,593 hours from last week. Metroid Prime: Trilogy had 601,776 Total Hours reported, an increase of 36,869 hours from last week. Call of Duty: Modern Warfare [Reflex] had 403,907 Total Hours reported, an increase of 83,638 hours from last week. House of the Dead: Overkill 's Amazon.com sale rank is #57, and is selling for $12.99. The Conduit 's sale ranked is #875, and is selling for $21.79. Metroid Prime: Trilogy is ranked #154, and is selling for $44.00 from Amazon.com 2nd Party/3rd Party Sellers. Call of Duty: Modern Warfare [Reflex] is ranked #123, with a selling price of $46.99. House of the Dead: Overkill had 445 more players reporting data this week, than last week. The Conduit had 1,075 more players reporting data this week. Metroid Prime: Trilogy had 1,503 more players reporting data this week. Call of Duty: Modern Warfare [Reflex] gained 2,600 more players reporting data in the last week. As I reported last Friday, Metroid Prime Trilogy Collector's Edition is no longer being published or shipped from Nintendo. When the I broke the news last week, it spread pretty quickly around the internet, and I'm hoping that many gamers, and maybe some of you that visit my blog every now and then, were able to buy the game before it becomes harder to find. Being that Metroid Prime Trilogy Collector's Edition is no longer being published or shipped from Nintendo, I'm going to replace it next week, with another "shooter" game that was released on the Wii in 2009. I will track Metroid Prime Trilogy's stats every now and then, to see how the game is performing, but I probably won't report it on a weekly basis. Being that Metroid Prime Trilogy Collector's Edition isn't being published anymore, did my news last week help any of you make a decision to buy the game? If so, were you able to locate a copy locally, or did you buy it offline? As I noted last week, I did acquire a video capturing device, and that's how the pictures of the Nintendo Channel Stats/Data were provided in the photo above. I did need a few more items, other than just the device to get it all set up, and I received my last item in the mail today and got everything set up and working this evening. The Nintendo Channel data was captured after the Nintendo Channel updated on Monday, January 11, 2010. Numbers of players reporting data are rounded down to the nearest whole number. I am glad to see Call of Duty continue to gain players. It seems as though that it will have the same legs that WaW had. On the Metroid Prime Trilogy front I haven't been able to get a copy yet, but I am going to a liquidation sale today so I am hoping I might be able to get a copy. @I won't be able to tell for a while, but I'm definitely interested to see how COD does.